There’s nothing like going out for a bike ride in the summer on the west coast of B.C. The hard part? Searching for a bike to do it if you’re a casual rider looking to take things to another level. That’s where the Norco FBR 3 road bike comes into play—a bike I’ve had for almost a year that has been a blast to ride. It took some time to decide what type of bike to purchase. I wanted something lightweight that could also handle trails and such, but in the end I decided against a hybrid and more towards a road bike cross as 90% of my riding would be on paved trails or roads. 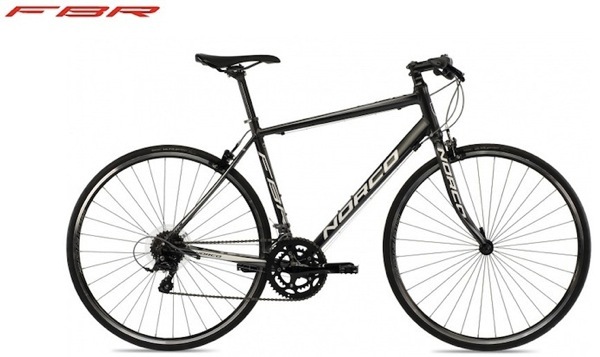 After some searching, the Norco FBR series fit the bill. This lightweight bike brings road bike feel to a traditional flat top bar, allowing you to cruise around town with ease with the upright feel of a flat bar. The FBR 3 model we purchased was sporty, lightweight and affordable. What a difference the weight makes compared to your traditional mountain bike or hybrid bike! Acceleration is effortless and gear shifting smooth, with great brakes to boot. We were glad we did not opt for a hybrid or other bike with shocks, as that can hinder your pedalling energy when you’re only riding on pavement. We bought our FBR 3 from the fine folks at Brentwood Cycle located in Central Saanich on Keating Cross Road. They price match competitors and also have excellent service, which included one year of free tune ups and an additional year end tune up. Even when we asked for help putting on our Shimano pedal clips, the store did it free of charge. Now that’s excellent customer service that will keep us coming back. At the end of the day, our FBR 3 cost just over $600 plus tax (on sale) for a Canadian-made bike that is just awesome. If you’re looking for a lightweight bike to take out on the weekends, definitely consider the FBR series from Norco. What’s your bike of choice right now?